SA706418 was successfully added to your cart! SA706418 could not be added as a favorite. Please make sure you are logged in. 7 ft. Right sickle with chrome topserrated sections. Fits New Holland windrowers 907, 909, 910, 912 and 114 Pivot Tongue. Sickle sections are bolted to knifeback. Order hi-arch holddown clips if your sickle is not presently the bolt-on design. Use with SA706417 7 ft. Left. Left shown. 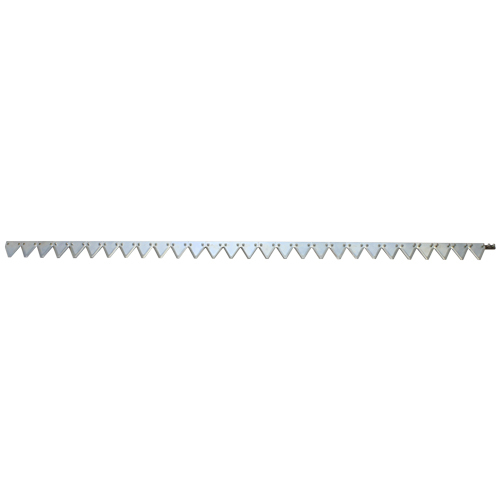 7 ft. Left sickle with chrome topserrated sections. Fits New Holland windrowers 907, 909, 910, 912 and 114 Pivot Tongue.